How do we achieve our goals? What motivates us? When are we intrinsically motivated and when do we need others to give us 'a bit of a push'? Why do we procrastinate? Can we be more productive? We tried to find answers to these questions and built Kaizen. Kaizen is an experimental device that intentionally uses peer influence to improve productivity. In our research we found that people find it hard to work on their big and seemingly far away goals, with Kaizen they can break these down and be productive on an everyday basis to continuously work towards the big goals. We based the idea, and eventually the visual communication, on a 2007 study on electrictiy consumption in California. In this study, Robert Cialdini and a team of researchers looked at the energy consumption of households and compared it with their neighbourhood's average. If a household was above average they put a door hanger with a sad smiley face on their door. If a household was below average the door hanger had a happy smiley face. They found, and that's the part that intrigued us, that social norm in combination with a smiley face was by far the most effective way to change people's behavior. Time was the key aspect that emerged during our research: How do we spend our time? And, can we make better use of our time to make sure we reach our goals? To find out we built prototypes to monitor our time, make us aware of how we spend it and to test what helps us spend time well. The Kaizen app needed to be simple. The interface focuses on the main interaction, which is the input of your own productivity. It then gives you an overview of your own data and your team's data. An additional benefit is that the app analyses this data for you. You don't only see how much you've been working, but also how productive you were, what times of the day were your most productive hours? Kaizen interprets that data for you. Who would be a good study partner based on similar working rhythms. Where are you at your best? One major drawback of having Kaizen as an app, was that you needed to use your phone to input your productivity. That in itself was a contradiction as your phone was likely to distract you from your work. 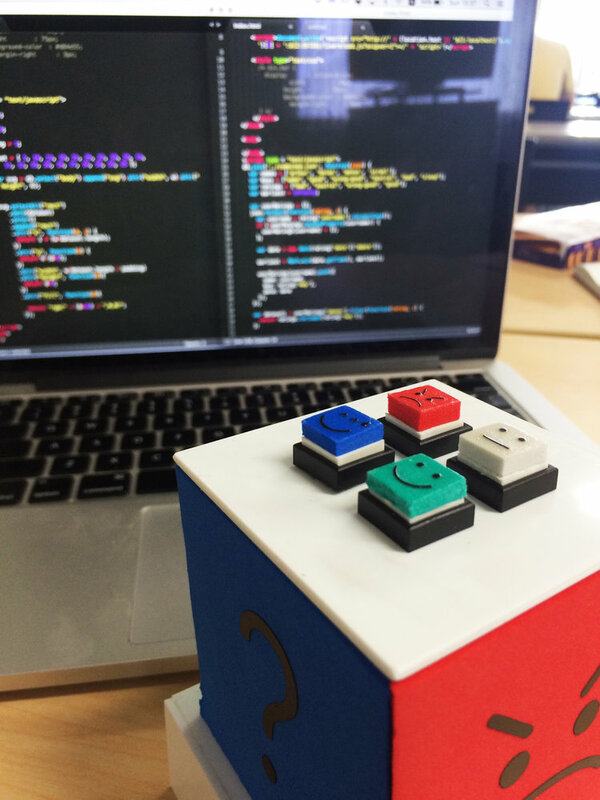 So we decided to build a simple physical device that you could place on your desk.